If you’re suffering from a chronic medical illness, you know that medicine can only go so far in making you feel better. However, there is a surprisingly easy technique that can relieve some symptoms of your illness and provide a multitude of benefits to your overall health. In fact, you might already have it in your house…perhaps under the kitchen table while you eat. I’m talking about pets…and animal-assisted therapy! Animal-Assisted Therapy: What Is It? Having a four-legged bundle of joy around has been proven to help many patients feel happier and healthier. Heck, if you’re a pet owner, you probably already know that your beloved Fluffy is a reliable source of stress-relief. However, animal-assisted therapy (AAT), also known as pet-assisted therapy, is recognized as an actual intervention that uses animal interaction to speed up recovery from health issues and help patients deal with certain medical conditions. The theory was initially criticized when it was presented in 1961 by American child psychologist, Dr. Boris Levinson. However, a survey he conducted 10 years later found that 16% of 319 psychologists used companion animals during their therapy sessions. This showed that people were warming up to the idea of animal-assisted therapy. How Can Animal-Assisted Therapy Help? AAT has been proven to help patients with chronic heart failure, cancer, post-traumatic stress disorder, autism, attention deficit hyperactivity disorder (ADHD), and even schizophrenia. Studies have also shown that AAT improves mood and behavior in seniors with dementia. Additional benefits of AAT include reduced loneliness, depression, and agitated behaviors. ATT has also been shown to increase engagement, improve nutritional intake, encourage social interactions, and boost overall well-being. 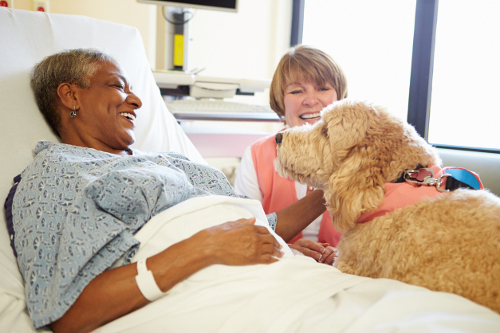 How exactly does the pet-assisted therapy work? It stems from your interaction with a therapy animal, such as feeding, grooming, or bathing it. This form of safe, loyal, and positive engagement provides stimulation, and is something for you to think about and talk about with others. Pets provide emotional stability in times of stress, as well as encourage mobility and a healthier lifestyle (e.g., walking a dog). They comfort those with language difficulties, as animals communicate differently, and also increase self-esteem in seniors by allowing them to be responsible for something. Grooming and feeding pets can also improve motor skills. Many types of animals can be involved in this intervention: cats, dogs, horses, hedgehogs, rabbits, snakes, and even spiders! But fear not, rules and regulations are in place to ensure these animals are clean, vaccinated, and well-trained. Although AAT cannot replace the use of medication in extreme cases like Alzheimer’s disease, it can be a useful component in the healing, calming, and improvement of your quality of life. So if you have a pet already, thank them for all of the amazing health benefits they’ve been providing to you! If you don’t, and you’re suffering from some form of chronic illness, talk to your doctor or caregiver about pet-assisted therapy and how to get access to a therapy animal. Whiteman, H., “Animal-assisted therapy: is it undervalued as an alternative treatment?” Medical News Today, June 12, 2014; http://www.medicalnewstoday.com/articles/278173.php, last accessed April 25, 2017. East, A., “The Benefits of Pet Therapy for Seniors,” Miami’s Community Newspapers, April 4, 2017; http://communitynewspapers.com/coralgables/the-benefits-of-pet-therapy-for-seniors/, last accessed April 25, 2017.